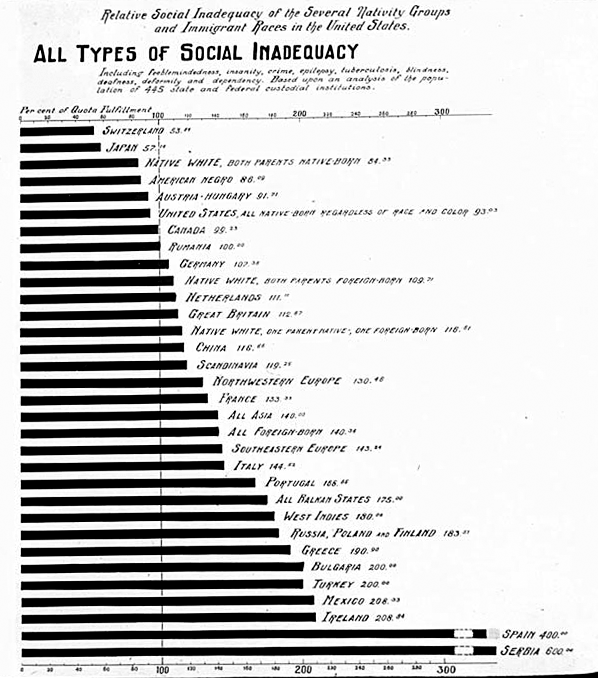 Proponents of eugenics believed that various forms of "social inadequacy", including mental illness, criminality, and physical handicaps, were the result of inherited genetic traits. Some studies, such as this one from 1922, attempted to link these tendencies to specific nationalities and ethnic groups, including people of African and Asian descent and people from Eastern and Southern Europe. This and other studies provided a "scientific" justification for exclusionary immigration laws like those passed in 1905, 1921, and 1924. Eugenicists and their political allies argued that "inferior" immigrants, because of their bad genes, would weaken the nation as a whole. Source | "Relative social inadequacy of the several nativity groups and immigrant groups of the U.S.: all types of social inadequacy," the Harry H. Laughlin Papers, Truman State University, Lantern Slides, Black Case, Section 7, 1707 (1922). Cite This document | Department of Genetics, Carnegie Institute, “Graph of "Social Inadequacy" Among Immigrant Groups, 1922,” HERB: Resources for Teachers, accessed April 20, 2019, https://herb.ashp.cuny.edu/items/show/1231.